The WMOC team will organise sightseeing events and trips. Suggestions will be provided on the sights to visit during your stay in Estonia. Tallinn’s medieval Old Town is known around the world for its authentic Hanseatic architecture. The old town that is listed in the UNESCO World Heritage Sites attracts tourists with its historical atmosphere. Enjoy the cobblestone streets and houses dating back as far as to 11th century, visit a few of the local galleries and museums, indulge in small cosy cafés or restaurants and buy travel memorabilia from summer or Christmas open air Hanseatic fairs. 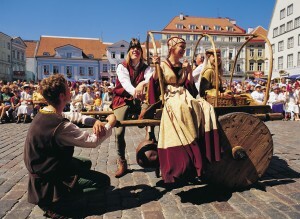 Tallinn was ranked as a European Capital of Culture for 2011. Just a 5 minute walk from the medieval Old Town is the thriving business centre of Tallinn: modern glass and steel skyscrapers, high-tech hotels and conference centres, hundreds of restaurants and bars, banks and shopping. Here is everything you would expect from a modern European capital, within easy reach and for a friendlier price.